While I poked around Ringling Museum last November, all I really wanted was to transport myself back in time. What was it like to live when high craftsmanship was part of our daily value system? How would the gender portraits be received if they were hanging in Ca d’Zan? Everywhere I turned, there was beauty! I wanted to be able to make everything! So here back in Philly, in the 21st Century, I struggle. First off, the materials are different, safer, low VOCs, etc. and often inferior. I can’t actually work with high fume chemicals; I feel sick and get migraines. So I searched and experimented…. I first began thinking I would decoupage furniture. 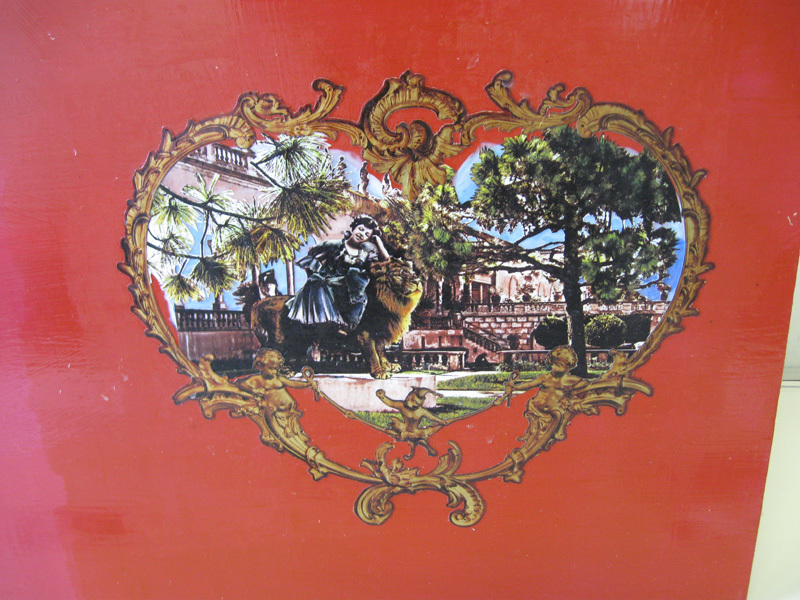 Kind of like the baroque decoupage and painted furniture. Although I am not really feeling the decoupage thing, I did find some interesting materials. One was a digital media coating by Golden. I painted it on foil paper and rice paper so i could run them through my printer. 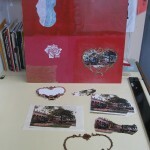 Another was Mod Podge and interestingly, you can add pigment and create a non-toxic paint that is wet-paper sandable. Nice! Also can use as a glaze over milk painted surfaces. Drawing reproductions of some of the photographs I gathered from the archives. 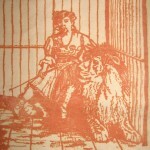 This was drawn using Lascaux screen-printing drawing fluid and the screen filler is Speedball. I only got three prints out of this screen, as the soda ash on the fabric disolved the filler. Welp!… back to the drawing board. I do need more practice drawing, not one of my strengths. I am such a nervous drawer and am really trying to loosen up a little more. I am learning to love drawing… oh yeah and next screen I will use Lascaux filler, although it takes days to remove when I want to reuse the screen. Next, I am finding ways to add multicolored prints to my work. 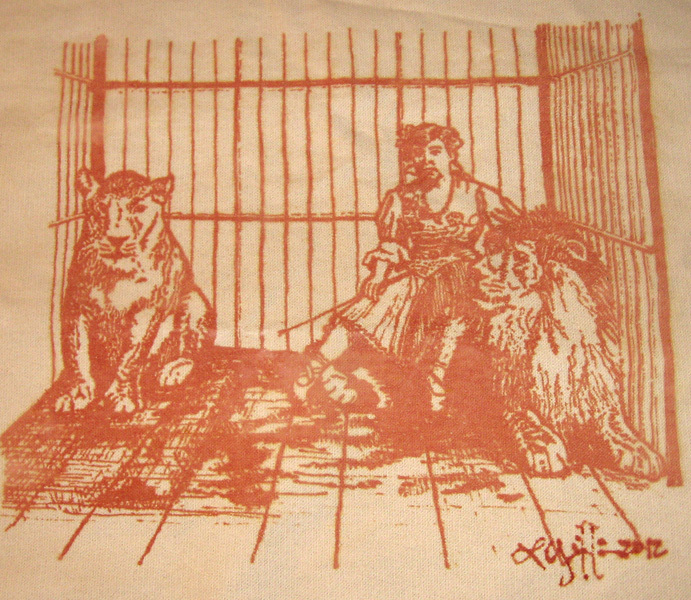 Stenciling – this is fiber reactive dye paste stenciled onto velvet. I love the potential for bringing in more color. One of Mable Ringlings love was color. 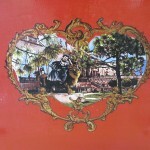 She had colored glass windows installed in Ca d’Zan – I think six different colored panes in all. This set the color scheme for the entire house – also trompe l’oeil, painted furniture, murals, patterns, and decorative motifs painted on the walls and ceilings in various rooms. So I am madly trying my stencil making. One thing is, stencils are easy to cut from polyester sheet, like Duralar film by Grafix. I cut using a fine tipped wood burning tool. 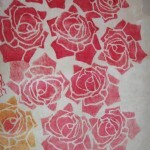 This entry was posted in musings, new work, process, textile printing on January 30, 2012 by laureen. 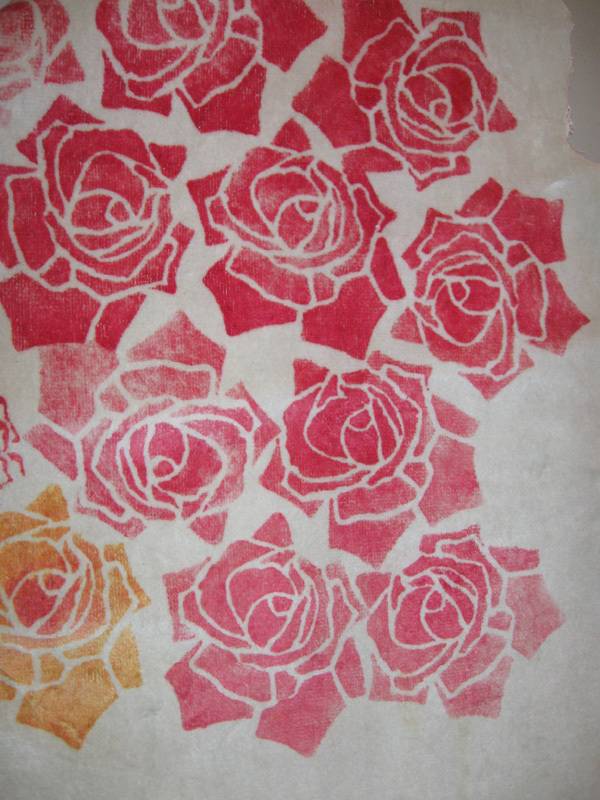 This summer I was very fortunate to teach Fabric Printing with Dye at Women’s Studio Workshop in Rosendale NY. Initially, I was so nervous, as teaching a technique that I invented through experimentation seemed so daunting. My students were wonderful and I look forward to doing this again sometime soon – hopefully. Teaching one’s peers is an amazingly gratifying experience!! 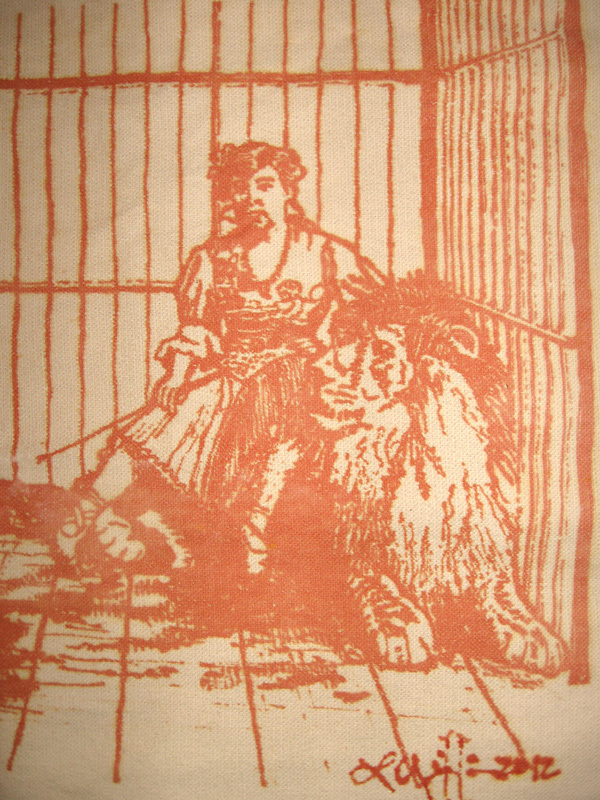 Print your photographic and hand-drawn images with dye and dye resist. 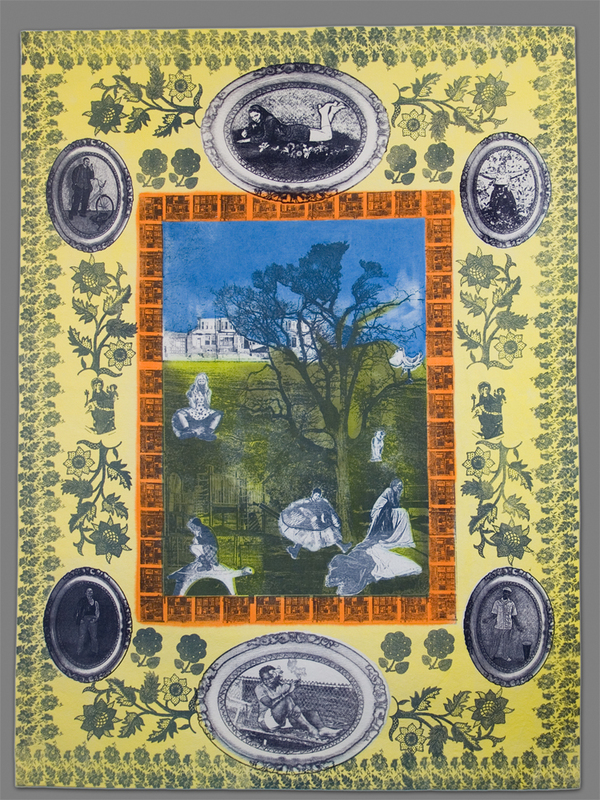 In this class, artists will learn to silkscreen fine detailed photographic images and drawings by using cold process fiber reactive dye pastes. We will focus on painting and precision silkscreening these fiber reactive dyes onto canvas and other cellulose based fabrics. The dyes penetrate into and bond with the fibers offering permanent and washable printed fabrics which can be used for upholstery, wearable art and clothing, or incorporation into artwork such as stretched over a frame and painted, waxed with encaustic, and sculpted with Paverpol. Learn techniques for converting digital photographs into graphic images for photo stencils, and drawing directly onto the screen. 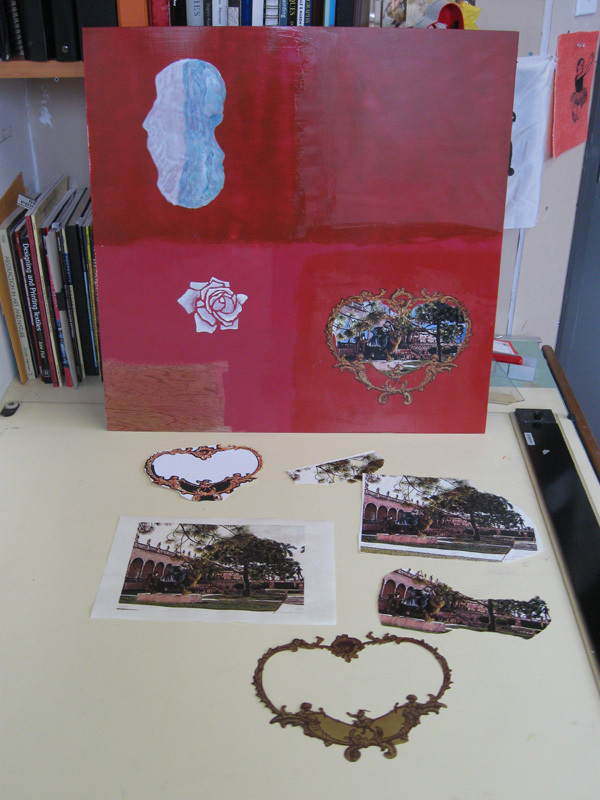 Students should bring digital images and/or digital cameras as well as line art for creating artwork for printing. It is recommended that artists have some experience with Adobe Photoshop. 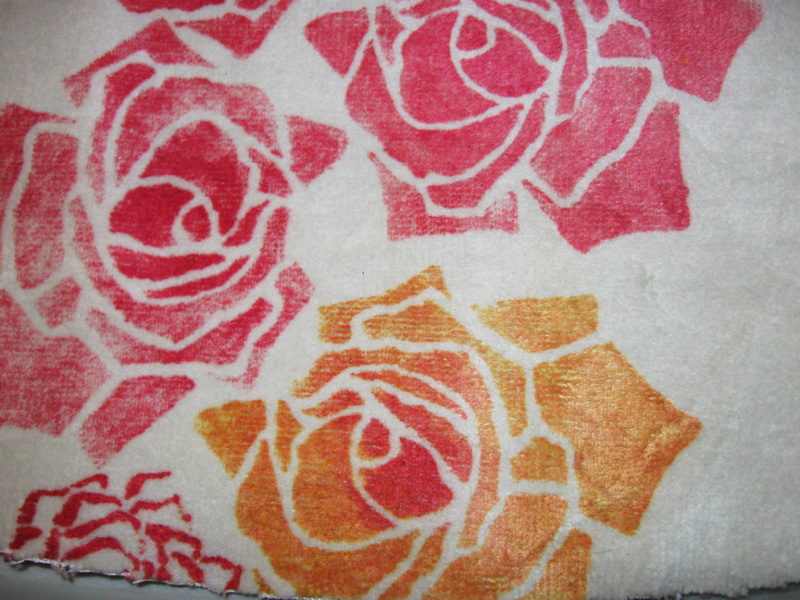 This entry was posted in textile printing on September 26, 2010 by laureen. A sense of courage is revealed as Karl prints a random pattern of leaves from both a hand drawn screen and by direct application of dye on leaves he found outdoors. Katie helps Karl position his screens and hold them in place as they compose an amazing random pattern on cotton. Helen experimented with a digital image she made of a couple peacock feathers. For her first try, she painted dye solution onto the peacock feather screen. Then she painted black dye onto fabric and then screened discharge paste through the peacock feather motif. Her most successful prints were made by painting a rainbow striped dye pattern onto a blank screen, and then screening discharge paste. 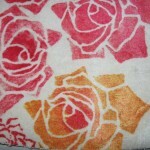 This entry was posted in textile printing on September 16, 2010 by laureen. Fiber Reactive Dyes (Jacquard Procion MX or Dharma Trading Co.) are amazing to use – one reason is they do not have to be heat-set when used on cotton. (I would imagine all cellulose based fabrics, but so far I have only printed onto cotton.) I apply the dye by hand with brushes and sponges – actually anything you would use to put a paint finish on a wall. The backgrounds become less uniform than vat dying, but I think they are more interesting and take on more texture often looking aged or worn. This is perfect for making commentary on time and history as in Homage to Seamstresses. First I soak the fabric in a soda ash bath and let it sit for awhile making sure the fibers are well saturated. Here I mixed coral pink with a small amount of alginate (just enough to get the dye to stay on the applicator) and a combination of a wide brush used for paintin faux linen textures and a fuzzy paint mit. (Next time I may add calsolene oil to aid dye spreading for the base color.) The fabric was canvas that had a very soft surface on one side. 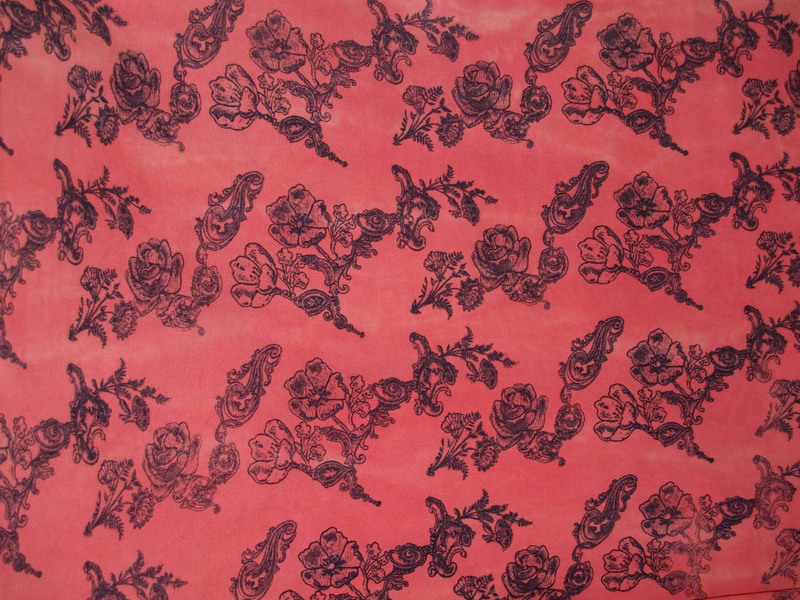 The effect is worn cotton velvet. Then the pattern is silk screened using a mixture of jetblack dye, sodium alginate, and rice paste. Here I added soda ash to the mixture as I did not trust the soda in the fabric was still affective. I am not sure this is necessary and new problems arise as a result. For some reason, the soda ash causes the rice paste to congeal and it becomes very gelatonous and difficult to apply. For some applications this may be fun as the pattern can become crackled. If the dye is not worked through the screen well enough, it will not pass through onto the fabric. In addition, the rice paste causes the dye to stay on the surface so the fabric has to be damp enough to attract the moisture of the dye into the fibers. Too much moisture causes bleeding. I suggest experimenting with an open mind onto scrap fabric in small quanities – my first attempts at home did not work out so well – I kept trying and now this!! Now to the COLD CURE Process – After each color application, I roll it in plastic overnight, for at least 12 hours. For the background colors I usually roll the fabric pretty much immediately as the dye will bleed and feather for more uniformity. I then unroll the fabric and let it sit to dry to damp for screen printing. Again test on small pieces to get a feel for what works for you. When you print the next layer, you need the pattern to sustain and not bleed and feather into itself like an old tattoo. Again -I roll the fabric into plastic to let it cure overnight. Please be careful with the screen printed pattern. You will have to wait until the dye is touchable before you roll it. When you can touch the printed dye and your finger comes away clean, you can safely and carefully lay a piece of plastic over the length of fabric and roll it up. I try to roll it crease free just to make sure the dye does not smudge. After drying, I rinse and wash. Sometimes, I rinse and wash twice as the rice paste takes a little more to remove and you may see a little bleeding. This will wash out the second time, especially if you use synthrapol or Dharma’s detergent subsitute. 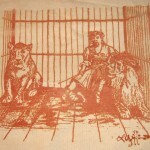 This entry was posted in textile printing on March 7, 2009 by laureen. First I would like to plug Women’s Studio Workshop and thank them for awarding me a fellowship and therefore giving me the chance to test my silkscreen printing techniques. I have been experimenting with pattern design and screen printing fiber reactive dye onto cotton. My first attempts simply followed the instructions on the sodium alginate package. However when I mixed alginate with fiber reactive dye and let it cold-cure, the dye bled and the pattern lost it crispness. I will write about this in detail later. At any rate my experiments entail combining rice paste or cornstarch with alginate to create dye pastes similar in consistency to acrylic based silkscreen inks. If applied correctly they do not bleed when screened onto damp fabric. So…WSW has large padded tables with registration rails for printing onto fabric larger than my 4×8 masonite table. I could cover the table with plastic sheeting and lay the base layer of dye down before printing the patterns. Also I could print on heavy canvases and create effects of a woven blanket and printed velvet as well as printing an allegorical tapestry. See Works in Progress and Flicker for images. Please be advised that my imagery may not be for everybody as I explore topics such as female sexuality and anarchy. This is another reason why WSW is key. 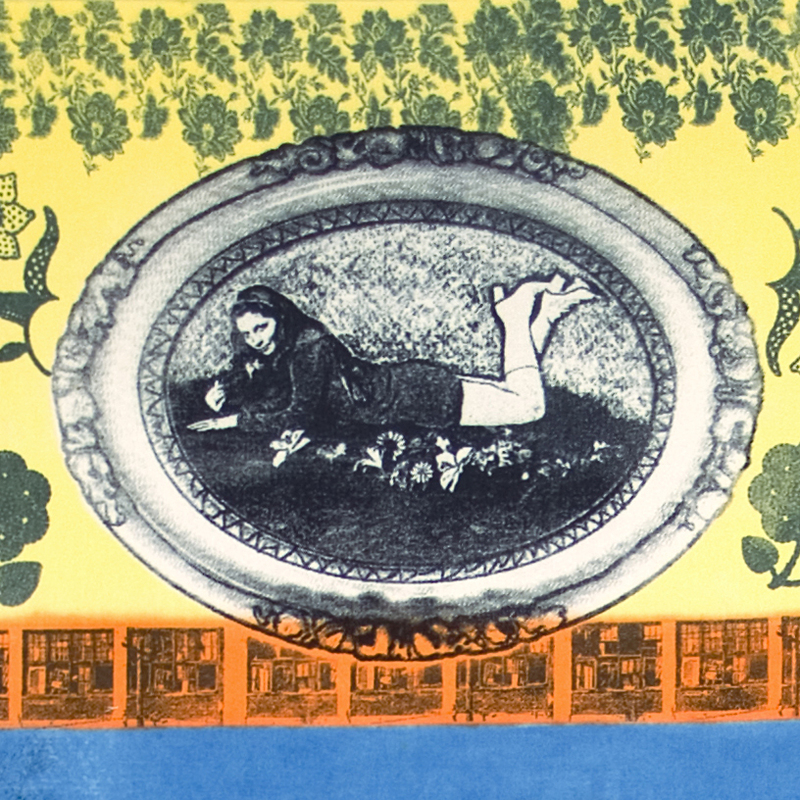 Exploring issues of female sexuality is celebrated in an all women’s space.